How to stand out at your next job fair. We know that job fairs can seem overwhelming. With so many other job seekers, it may seem hard to stand out among the crowd and make your mark to companies you are interested in. However, a job fair is an important opportunity to meet company representatives in an exclusive and informal setting. “Job fairs provide job seekers with a unique opportunity to network with several different employers at once and to make a valuable first impression. Presenting well to an employer at a job fair can really give you the edge on other candidates who are only submitting their resume online,” says Monica, a senior college and diversity recruiter at Citizens. 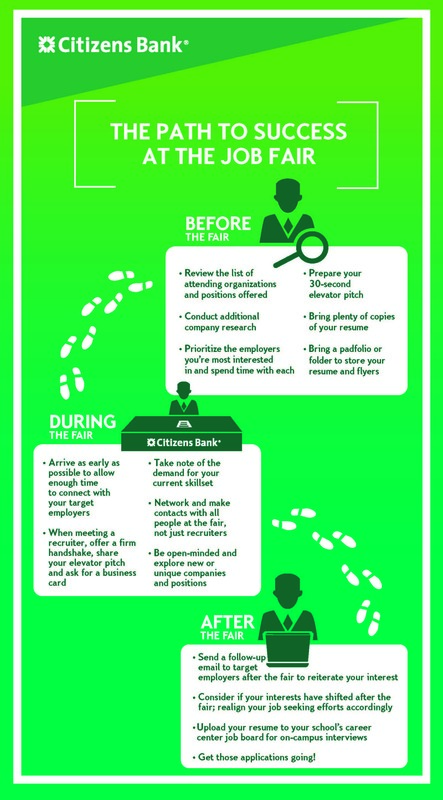 Below we share tips to “walk the path to success” at your next job fair. Learn more about the wide variety of career opportunities and development programs we offer for recent college graduates.